Fiji Meteorological Service - What's the Fiji weather forecast? What's the Fiji weather forecast? Fiji Meteorological Service (FMS) is a government department of Fiji responsible for providing weather forecasts. It is based in Nadi, and since 1985 it has been responsible for tracking cyclones in the south west Pacific region. Since 1995, the FMS has been one of the Regional Specialized Meteorological Centers, of which there are seven world wide as shown by the map below. It's responsibility is detecting tropical cyclones, and providing basic information about the systems and to forecast it's position, movement and intensity in the area shown on the map. FMS is also responsible for naming cyclones once a tropical storm has developed into a certain level of intensity. The regional meteorological centre in Melbourne is responsible for distribution of transport, deposition, and dispersion modeling, in the event of an environmental catastrophe for the south west Pacific region. 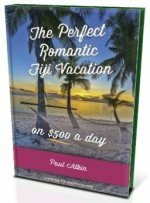 Fiji's wet season is from November to April and is also the time when tropical cyclones are likely to occur. Strong devastating cyclones are relatively rare for Fiji with only 2 or 3 occurring per decade. The map above is an example of a cyclone season. This cyclone season officially went from November 6, 2012 to May 1, 2013. The 2 big islands just north west of the middle of the map is Fiji, with the string of bright orange dots passing through. The dots represent cyclones, at 6-hour intervals, with the brighter the dot, the faster the wind speeds. 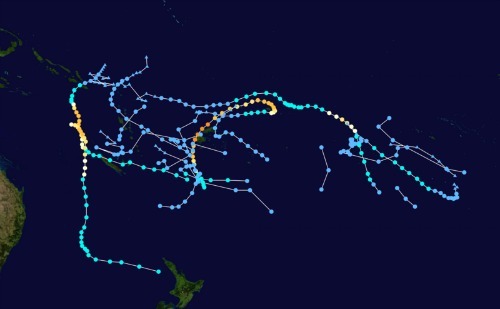 These same bright orange dots passing through Fiji was the most destructive cyclone to hit Fiji in 20 years. Cyclone Evan reached speeds topping 185 km/h (115 mph) and smashed into Samoa killing at least 8 people before making it's way to Fiji. However, Fiji escaped with relatively minor damage with no deaths reported. For more information visit it's website at http://www.met.gov.fj/.